Archival, Environmental, & Physical Issues urged your correspondent to make a Journey to the West recently. But not—as in the classic Chinese tale—to recover lost Buddhist Manuscripts. A week’s Jin-Shin-Jyutsu/Acupressure-Cure in Boulder, however, did surround me with many evidences of the Power of the Buddha’s Teachings in this Left-over-Hippies Colorado Sanctuary. Colorado's Boulder not Wholly Buddhist: Here's a Mysterious Masonic Marble! My B&B hostess had filled her charming Victorian Carpenter-Gothic house with Images from the Mysterious East, including a handsome view of the Great Potala Monastery in Tibet’s capital-city. She had never actually been there, so I told her something of my adventures photographing the Potala & the Dalai Lama’s Summer-Palace for my INFOTOGRAPHY™ Archives. I was even permitted to photograph the Dalai Lama’s Radiogram, given him years ago by Pandit Nehru! As the much-revered Spiritual-Leader of many Tibetans has long since departed, this Vintage Radio is now covered with dust—and piles of White Silk Scarves, offerings of the Faithful. In Boulder, there are also Buddhist buildings & ample Buddhist Decoration & Art. But this is also the formerly Wild West, so it’s not surprising to discover handsome bronze sculptures of Cowboys, Coyotes, & Covered-Wagons scattered around. This is also true of nearby Golden—home of the Coors Brewery—which also features a life-sized bronze of founder Adolph Coors! But there are Living Artists—following in Remington’s footsteps—who are creating handsome Western Sculptures that you can collect without mortgaging your Town-house or Country Estate. Western Bronzes on View at Boulder's Leanin' Tree Museum. To appreciate their works—and learn more about these talented sculptors—Boulder is the place to visit. Especially the Leanin’ Tree, an astonishing indoor/outdoor museum of Modern Images of the Old West. There are 25 life-sized & monumental bronzes in the outdoor garden. Inside, handsome paintings of Western-Scenes & Cowboys & Indians abound. The exhibitions concentrate on painters & sculptors working in the Post-1950’s period. Founded by Ed Trumble—whose line of Leanin’ Tree greeting-cards has made this possible—the museum makes a great Visual-Prelude to visiting Rocky Mountain National Park just "up the road a piece." Briefly in the Bay Area—primarily to add to my Steinbeck Country photo-archive—I had time to check-out only a few of the interesting museums & collections on offer. I just did not have time to visit the Oakland Museum, whose Historic California holdings & special-exhibitions are always informative & intriguing. The University of California in Berkeley continues on its Building-Binge, most of the remaining lawns being swallowed up by High Rise research & classroom structures, including a new East Asian Library. As the famed Bancroft Library—formed from the core-collections of California Historian, Hubert Howe Bancroft—is In Process of Expansion, I was directed to the temporary Downtown Berkeley office of its Director, Charles Faulhaber. There are some Loney & Dangerfield Family papers & historical artifacts now in the collections—and I donate to the Library as well—so I like to check-in when in town. My Great-Uncle, Dr. Arthur Dangerfield—having recovered his health as a "Limey Cowboy," in the High Sierras, after a severe bout of illness following his Medical Studies in Edinburgh—had returned to California, as he had found no possibilities of Buying a Practice in Scotland or England, as was then the custom, noted in A. J. Cronin’s The Citadel. In Mid-April 1906, he sat the first day of the California Medical Licensing Examination. That evening, he went to hear Enrico Caruso at the San Francisco Opera. In the middle of the night, he found his second-story bed was sliding toward the collapsing front of the room: It was the Great San Francisco Earthquake & Fire! There was no second-day of Medical Exams. Uncle Arthur was made a doctor/surgeon on the spot. What’s more, he was put in charge of the Chinese Refugee Camp at the Presidio. His Orders in Chinese—from General Pershing—are now in the Bancroft Collections, as are his memoirs of both Cowboy & Quake. His cowboy-gear & his Western-Saddle & Bridle are now in the American Museum in Bath, England, however. Endangered Species: Bowles Men's Residence-Hall at UC/Berkeley. But I had also made the Pilgrimage to UC for another reason: I wanted to photograph Bowles Hall. Recently, some Bowles "Old Boys" have been contacting former residents to enlist their support in restoring the long-neglected Oxford/Cambridge-style Men’s College-Residence to its former glories. 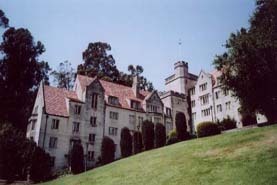 It is an imposing multi-storied Neo-Gothic castle—made of reinforced-concrete—set into the steep slopes of "Big C" Hill, with Ernest Lawrence’s historic Cyclotron up above. It is sited between the immense Memorial Stadium & the almost as immense William Randolph Hearst Greek Theatre. Bowles Hall was inaugurated shortly before the disastrous 1929 Stock-Market Crash. So its imitation of the customs of Men’s Colleges in Cambridge & Oxford was something special for UC students during the Age of the Great Depression. Mrs. Bowles hoped that California boys might learn how to become grown-up gentlemen & scholars. And that the older, more senior boys would mentor their younger room-mates! After the War, the Navy was cycled-out, and new Bowles-men were installed. Dean Chaffee Hall, Dean of Men, chose applicants who were Outstanding Student-Leaders, Outstanding Athletes, Outstanding Students, & some "Legacies," of course. Post-Mario Savio & the Berkeley Free-Speech Movement—not to mention the Equal Opportunity for All & Political-Correctness—the very idea of an Elitist Men’s Dorm became laughable at UC. So, over the years, the Hall was allowed to deteriorate, and currently houses only Freshmen Men. It is endangered, however, by the Mammoth Haas School of Business, just across Campus Road from Bowles. Haas wants to gut Bowles and turn it into a Five-Star Executive Hotel for monstrously overpaid CEO’s coming to Haas for Conferences & Seminars on How To Make More Money! How this will all end, only the UC Regents know… But it seems unlikely that Bowles Hall can ever be returned to what it was when I was an astonished resident—one year with an All-American football-star for a room-mate! Initially, I was in the center-room of the suite just above the Bowles Entrance, from whose windows other residents dropped Water-Bags on the heads of the Unsuspecting. This meant sudden incursions & water splattered all over my textbooks. What was so very special at that time was that many of the Bowles Seniors were on the GI-Bill & had served Overseas in Europe & in the Pacific. This was Mentoring with a Capital M! Imagine being in a Math Class with a former US Army Air Force Navigator. Or in a French Class with a Sergeant who had helped Liberate Paris! Both the Commons & the handsome Neo-Tudor wood-paneled Lounge still exist, though worn with wear. But this is a College Life-Style whose time has passed. Restore Bowles Hall by all means, but this is the Era of Open Admissions, is it not? Well, not exactly at UC/Berkeley—where even a Straight A-Average may get you into UC/Santa Cruz instead. John Steinbeck Portrait in Salinas Steinbeck Family Home. Speaking of Santa Cruz, that is part of Steinbeck Country. I had already photographed it & Pacific Grove—where John Steinbeck wrote early works in the family’s summer-house—for a slide-presentation projected initially at Austria’s Bregenz Festival. The opera-version of Steinbeck’s Of Mice & Men—by composer Carlisle Floyd—was being given its European premiere. Many of the festival-patrons & teachers in the annual Festival Opera Workshop had no idea what Steinbeck’s "Long Valley" looked like. Most were dazzled by my INFOTOGRAPHY™ images, and some even made plans to include Salinas, Monterey, & Carmel in forthcoming visits to San Francisco. And there was The Question: Why don’t you do a photo-book of these wonderful scenes? Answer: On my return to New York, I could never get past Publishers’ Receptionists: "We only talk to Authors’ Agents." "I don’t have an agent. And I’m not the author—I hope to use Steinbeck Quotes as photo-captions—but this is about my Steinbeck Country Photos…"
"Then have your photo-agent contact us!" "I don’t have a photo-agent. Those I know about won’t handle anything less than a multi-thousand-dollar photo-shoot for fashion-mags…"
So I have decided to do the book On-line: This will take a while, as I am off to Europe all summer for the annual Music-Theatre Festival Round. Ultimately, however, it will appear in the GLENN LONEY BOOK SHOP, sited on ArtsArchive.biz. Steinbeck Family Home in Salinas. But I did go back to Salinas to add to the Steinbeck-Country Photo-Archive. When it opened, I had photographed the National Steinbeck Center Museum in some detail. Also the downstairs-rooms of the Steinbeck Family Home. But the Museum had a fascinating reconstruction of the young John Steinbeck’s bedroom. I wanted to photograph the original, but the last time I dropped by the house, I was told by the noontime-lunch-manager that the second-floor rooms were Closed to the Public! 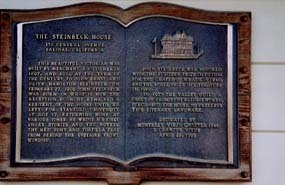 Steinbeck House Plaque. Courtesy of E Clampus Vitus. Fortunately, my mother’s family came from Salinas—and Ohio, before that—so I still have cousins there who are actively involved in preserving the Steinbeck Legacy. My cousin, Patsy Adcock Garlinger, was one of the prime-movers in saving the Family Home, when the city wanted to raze it for parking! Her father, Uncle Bob Adcock, was fond—when touring in Europe, where I was then teaching—of telling astonished Steinbeck fans that he "gave Steinbeck a bloody-nose in the sixth-grade!" 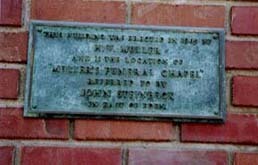 Muller's Funeral Chapel: Another "Real Place" in Steinbeck's Fiction. At the Steinbeck Center Museum, I also photographed the new Rabobank Agriculture Museum, installed in the museum’s former special-exhibition spaces. If you want to know more about Lettuce-Growing, Lettuce-Harvesting, & Lettuce-Packing, this is the Place! You could even get an insight into Steinbeck’s East of Eden! There’s also a nod to labor-leader Cesar Chavez & Mexican Workers! Salinas Agriculture Museum: Marilyn Monroe Presents Two Big Artichokes. The National Steinbeck Center is located at One Main Street, Salinas, CA 93901. Also, check-out www.steinbeck.org! Just down Main Street, some historic-buildings have been torn down to construct a Mayan-styled Multiplex Movie-theatre. It is called the Mayan, appropriately enough. The Steinbeck Connection must be his book, The Sea of Cortez. But weren’t those Indians Aztecs? Onward & Upward to Stanford! Hoover Tower at Stanford University: Student Saying" "Herbert Hoover's Last Erection!" John Steinbeck was a Stanford Drop-out, but, while enrolled, he lived in Encina Hall. A Stanford grad myself, I had already photographed the Hall, if not his actual room. Still, whenever I’m in the Bay Area, I make a point of visiting the Stanford Campus & Palo Alto’s Peninsula Creamery—where the egg-salad-sandwiches & thick malt-shakes haven’t changed in Fifty Years! Both Stanford & Palo Alto are over-built now, but still a-building. So there is almost no street-parking anymore, thanks to the ballooning Overspill of Silicon Valley. Thus, it was almost impossible to find a Visitors’ Parking slot near the Quad & Memorial Chapel, whose fabulous Biblical Mosaics I photograph every trip. 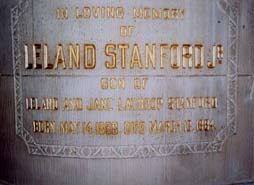 Memorial to Leland Stanford Junior, for whom Stanford University is Named. Ornate Italian Stone-carving on Corner of Stanford Quad. With no parking-slot, I was unable to see the Tuareg Exhibition currently on view at the museum, but it is thoroughly described in the latest issue of the excellent alumni mag, Stanford. Curated by Thomas K. Seligman, Director of the Cantor Arts Center, this is the first major Tuareg exhibition in the United States. I did pull into a UnivServiceSlot briefly for some shots of the impressive forest of Rodin Sculptures outside the museum. As at the Brooklyn Museum, these are the gifts of Iris Cantor & her late husband, B. Gerald Cantor, for whom the museum has been renamed. There is a handsome children’s ABC guide to the Museum Collections, with photos of actual objects or artworks keyed to each Alphabet-Letter. There’s also map-guide to the more than 40 sculptures on view around the campus. Including works by George Segal, Josef Albers, Benny Bufano, Mark di Suvero, Sandy Calder, Andy Goldsworthy, Joan Mirò, Henry Moore, Arnaldo Pomodoro, Maya Lin, & Bev Pepper! SFMoMA SIgnage on Post-Modernist Facade. At the San Francisco Museum of Modern Art, Picasso & American Art—seen previously in Manhattan at the Whitney Museum—ended 28 May. The Brice Marden Retrospective—recently on view at the Metropolitan Museum—closed on 13 May. This is not to suggest that San Francisco is the End of the Road for shows seen initially in the East. But that certainly did seem to be true way back in the 1950s & 1960s, especially for Broadway Shows on tour, not only Museum-Shows. With the gradual emergence of Los Angeles as a major art-capital—or at least with enough Capital to purchase Major Art—the Journey’s End is now often the City of the Angels. Fortunately, museums in both California Culture-Centers have impressive collections which they can draw upon for locally-launched touring-exhibitions. Whitney Picasso Show at SFMoMA. For instance, SFMoMA’s own Klee Collection—with some 150 loaned pieces—is the core of Structuring the Spiritual: Paul Klee’s Cubism in Context. This will close on 9 September 2007. If you have thought of Klee as merely an ingenious Cubist-designer or even, on occasion, a wry humorist, this suite of drawings & paintings emphasizes something more "ethereal," to borrow the curator’s description. The Klees are shown in the context of Matisse & Beyond, drawing on SFMoMA’s impressive Matisses. Then there’s Matisse: Painter as Sculptor—closing 16 September—with a core of some 40 Matisse sculptures, shown with related drawings, paintings, and studio-photographs. This is either "fleshed-out," or enhanced, with contextual-works by Picasso, Giacometti, Degas, Cézanne, Rodin, & Brancusi. A bonus of the Whitney Picasso & American Artists show—not seen in New York—is the revelation of a Hidden Picasso in SFMoMA’s own collections. During conservation of Rue de Montmartre, X-rays revealed an under-painting resembling Picasso’s Le Moulin de la Galette. Previously seen in Manhattan, Martin Munkacsi: Think While You Shoot! 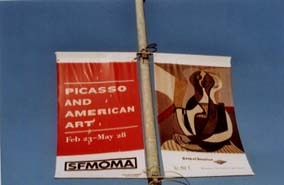 is on view at SFMoMA until 16 September. After Munkacsi’s death, his works were scattered—some even destroyed—because two major museums refused to acquire his collections. Now linked administratively as the Fine Arts Museums of San Francisco, the California Palace of the Legion of Honor & the M. H. de Young Museum offer two quite different Architectural Visions, not far from the Golden Gate. A handsome copy of the original Palace of the Legion of Honor in Paris, San Francisco’s version is sited on a hilltop in Lincoln Park, with a View of the Bridge. It is effectively the gift of the Sugar-Baron Adolph Spreckels and his art-smitten wife, Alma de Brettville Spreckels. A great admirer of both Rodin & Loie Fuller, Alma not only enshrined their talents here, but also on the banks of Washington’s Columbia River, in Sam Hill’s astonishing Maryhill Museum, reported on last summer. California Palace of the Legion of Honor" Rodin's Thinker in Court of Honor. The Permanent Collections are primarily devoted to paintings, sculptures, furniture, & decoration from the Classic to the late 18th Century, the Rodins excepted. The Thinker is in the Court of Honor at the Palace! When the two museums were consolidated, Period Rooms in the de Young were removed to the Palace, as were Palace-holdings that were more proper to the de Young’s revised Focus & Time-Frames. Initially constructed in Spanish Plattoresque style for the 1915 Panama-Pacific Exhibition, the de Young was somewhat streamlined to prevent Earthquakes from shaking elaborate plaster-fragments free to fall down on passers-by. But even an external steel-beam Earthquake-Stabilizer wasn’t enough. So the Swiss architects, Herzog & de Meuron were engaged to create a new de Young in Golden Gate Park. In addition to many prestigious international projects, they are also designing the Great Stadium for the Beijing Olympics! What they have actually achieved, however, is open to debate. Or Interpretation… Even the de-ornamented Old de Young looked at home among the Park’s Eucalyptus Groves. This new rust-colored steel-structure looks strangely out-of-place: like the hulk of an abandoned Ocean-Liner. Perhaps it should be moored down at Fisherman’s Wharf? It does have a very high Twisted Tower that looms high over the park, a kind of Post-Modernist Landmark. At the top, fortunately, there are floor-to-ceiling windows on all four sides, with excellent Photo-Ops of San Francisco in all directions. View from the Top of New de Young Museum: Herzog & de Meuron's "Railroad-sheds." Instead of a single broad two-story exhibition & research building, however, the Swiss have devised a series of long, narrow rusted-metal ellipses, which—from the heights of the Tower—look like old Railroad-Sheds. On some of their narrow interior walls, viewing pictures is often rather like pausing to glimpse in a long curving hallway. Lighting & displays for Sculptures & Cult-Objects from African sources give new meaning to the phrase: The Dark Continent. But low-light-levels also affect the powers of Totems of Other Cultures, as well. The two Major Exhibitions currently at the de Young & the Legion are both scheduled to close on 10 June. If you read this on 9 June, it’s probably already too late to see the sole North American showing of Vivienne Westwood: 36 Years in Fashion. As for the Legion’s Masterpieces of French Jewelry, New Yorkers could have seen this handsome show way back in September 2006, at the Forbes Gallery, whence it originated. Dame Vivienne Westwood's Fashions at de Young Museum. The Victoria & Albert Museum organized Vivienne Westwood, but it would have been a Winner for the Met Museum’s Costume Institute Gala. New York’s loss is San Francisco’s gain. The Met’s Nan Kempner costume-parade is, however, scheduled for the de Young! Dame Vivienne Westwood, OBE, says: "You have a much better life if you wear impressive clothes,"
If you missed this dynamic show in San Francisco, do get the Vivienne Westwood catalogue, either from the V&A or from the de Young: www.famsf.org. At the Palace of the Legion of Honor, Masterpieces of French Jewelry is almost as fascinating, although in a rather different style. Art Nouveau is the essence of many of these handsome works of the jeweler’s art: the creations of Lalique & Boucheron are especially ingenious. French Jewelry at Legion of Honor: "Making a Silk Purse from a Sow's Ear" All Gone Wrong! Also on view: Mae West’s diamond-bracelet, as well as stunning Cartier pieces made for Marjorie Merriweather Post—the fabled hostess & Post Cereal Heiress. Art Deco style is invoked by pieces created by Van Cleef & Arpels as well as by Cartier. But later periods are also on view, including pieces by artists such as Jean Arp, Pablo Picasso, Max Ernst, Man Ray, & André Derain, from the 1960s & 1970s. Copyright © Glenn Loney 2007. No re-publication or broadcast use without proper credit of authorship. Suggested credit line: "Glenn Loney, Curator's Choice." Reproduction rights please contact: jslaff@nymuseums.com.